I’ve wondered this for a while, and I now have an answer. Yesterday I watched a fascinating TED discussion featuring Elon Musk. In it he discusses his vision for the future of a lot of stuff: cars (both in terms of their fuel and their autonomous capabilities), highways, long-distance travel, roofs, the power grid, and more. Near the end of the talk he shows a rendering of a ship designed to take a colony of people to Mars. 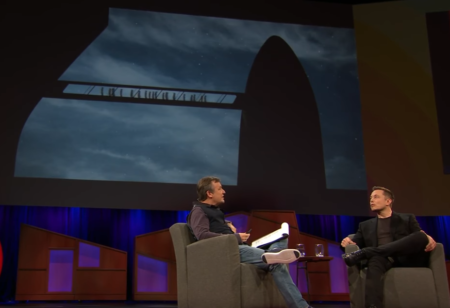 The moderator lets Musk boast about the size of the ship before asking the same question I’ve wondered: Why go to Mars when we could/should focus on improving Earth? Musk points out that he just spent 35 minutes discussing all the things he’s working on to improve Earth. Fair point. He goes on to talk about the misconception that technology automatically improves longer it exists. “It only improves if a lot of people work very hard to make it better,” he says, pointing out that neglected technology can actually degrade (like the space program). I’ve linked the quote to the exact moment he says it, just so you can hear the tone in his voice. It’s not pessimistic. Which is, I believe, exactly what we need. It’s all too easy to look at the future and be sad. I’m a pretty happy person, and even when I look at the future of the world, I see a daunting array of challenges: the environment, fundamentalist extremism, chocolate shortages, etc. So I really appreciate Musk sharing such a simple philosophy: Think about the future (not just in my thoughts, but in an active way) and not be sad. Sure, going to Mars isn’t super practical. It doesn’t directly solve a problem. But it is pretty cool. If we pulled it off, I’d be pretty damn excited about the future. This entry was posted on Thursday, May 4th, 2017 at 9:46 pm	and is filed under technology and tagged with technology. You can follow any responses to this entry through the RSS 2.0 feed. A. Because we can, B. Because Mars is such a harsh living environment it will give us systems and other technologies we can use that will help us if/when Earth’s environment starts to degrade. There’s also a notion that in order for the human race to thrive, we need to not be tied to one planet. We’re filling this one up.